We love it when we discover a photographer who started snapping as a hobby – but is then able to turn that interest into something more. Photographer Natalie Finney has done just that and we chat to her about her journey and passion for portraiture. Over the past two years, Natalie has focused on growing her business, slowly and steadily. She has amassed a varying portfolio of work, from weddings and corporate events, to commercial and fine-art/conceptual photography, however she is always drawn back to family portraiture, preferring to take a candid, documentary-styled approach. A complete guide to focal length and how it affects focus and depth of field. This is a masterclass in one episode. So sit back and enjoy this ride into how the focal length of your lens can impact depth of field, focus and much more. Master this and it will be a game changer. The focal length you shoot in can be random (it just felt right) or deliberate. Many photographers find they tend to like how . . . This week, we chat to photographer Ilona Nelson. We talk about how a small personal project grew from photographing 10 artists to a lifelong project involving hundreds of artists exhibited in Australia and internationally. We also cover how Ilona crowdfunded her project, winning government grants, the importance of side hustles – and much more. This week I chatted with Melbourne based artist Ilona Nelson. Nelson works predominantly with photography but . . . They said we’d never make it. But we got here! 200 episodes – so the champagne is flowing and we’re celebrating. Big thanks to all our listeners, we couldn’t have reached this milestone without you. We’re also celebrating the photography from Harry and Meghan’s Royal Wedding. 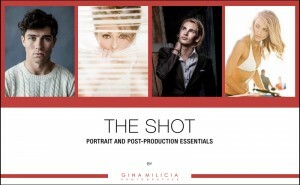 Gina and Valerie also share the most valuable lessons they’ve learnt in photography. USB port is where you connect your cable to download images off your camera or to tether while shooting USB . . .
With more photographers being asked to shoot short video clips, we’re definitely seeing a trend that you need to uplevel your skills to include video. While this may seem daunting, Gina and Valerie discuss the basics for you to consider to explore this exciting new side venture. From frame rate, to shutter speed, and everything in between, listen up! Camera settings Why shoot in manual mode What is frame rate How does Shutter Speed affect the “look” of your video What’s the . . .
Gina shares a hack on how to use high speed sync when you normally can’t! It’s about getting your speedlite to become intimate with your studio light – and convincing your camera to perform shutter speeds it usually won’t do. All is revealed in this episode, along with the benefits of using auto-ISO – and why this is a great function to take advantage of especially if you’re doing events. What do your white . . .
Photographing headshots can be challenging. Especially if you’re not working in a studio or some other controlled environment. And when you have to shoot multiple headshots in one day, how do you make the time to give each shot the care it deserves, but also ensure that you’re efficient and economical with your time. In this episode Gina and Valerie debrief after a full day of shooting stills and video in various locations. Gina shot Valerie – and they lived to tell the tale. The industry is changing. And an increasing number of clients want video – so many photographers are adding another string to their bow by providing moving images. That doesn’t mean you need to learn how to be a cinematographer for an Oscar-winning film. Most videos are used for content, website and social media. So if you want to expand your repertoire, here’s what you need to know. Gina and Valerie discuss this beginner’s guide to shooting video with DSLR and mirrorless. Listen into . . .
Don’t get caught with your pants down! Sometimes, despite our best intentions, stuff fails, sh*t happens and you feel like all is lost. But it doesn’t have to be! In this episode, Gina and Valerie discuss how to overcome common photo failures including technical errors, client dissatisfaction, dumb stuff and much more! Even the most experienced photographers occasionally drop the ball and botch a shoot. The good news is there is no such thing as failure only lessons. But when you’ve botched . . . In this episode we find the answers to a lot of questions! How often do cameras fail due to camera faults vs user error? When is the best time to buy a new camera? How can you look for damage on a used lens? Does placing Silica Gel packs in your camera bag really work? Why are leather camera bags a poor choice for storing gear? Are UV filters necessary? What are the dumbest things photographers have done to their camera? Hint: One involved super glue and the other WD40. Marty Strecker from . . .